Jon Holder, writer and illustrator extraordinaire, has set himself a monstrous challenge. Every day in 2013 will see him creating a different fantastical creature or character, using only paint, pencils and his own boundless imagination. Prepare to be impressed, amused, terrified, disgusted, appalled and enthralled by the results! You can catch a glimpse of them here…if you dare. And if that wasn’t enough, here’s your chance to get involved. Once a month, Jon will be creating a personalised monster for one lucky fan! All you have to do is email an image of something that has turned your day into a bit of a monster. Jon will pick his favourite and unleash his MONSTER OF THE MONTH here and on his Facebook page. The monster of your day could be the puddle that soaked your feet; a hot, smelly, commuter-packed train; that weed in your garden that keeps reappearing; the cake you made that turned out to be inedible; the shopping bag that split; the pile of washing up that won’t stop multiplying; the bus which arrived too late; the report that won’t write itself; the ketchup that won’t come out of the bottle just when you’ve got a delicious plate of chips; the cat that scratched your dining chairs … All those little things that turn a good day into a beastly one! And to kick-start the monthly competition, we have our very first MONSTER OF THE MONTH. 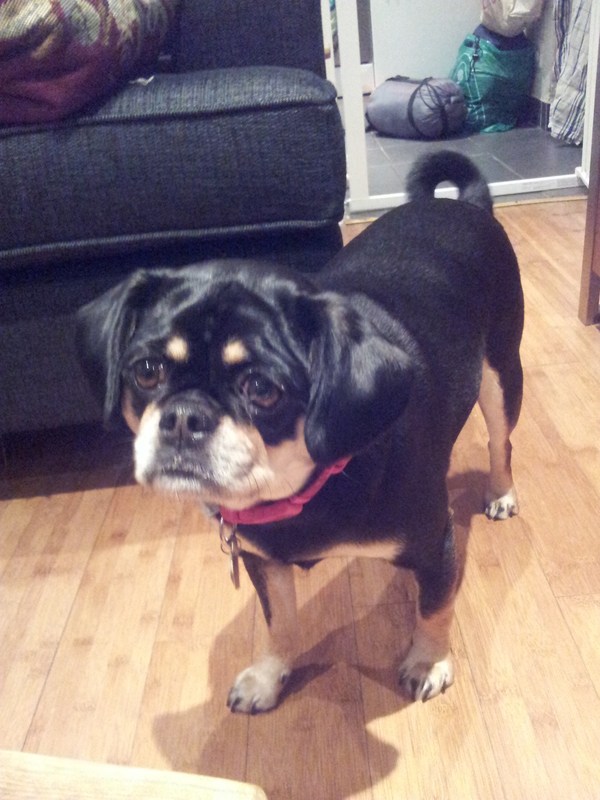 Camilla says: Miss Peggy is a lovely little Pugalier, so cheerful, loving and fun. But be warned, if there is a crumb of food near this sweet pup will turn into a capital ‘M’ Monster. Lunch time is the worst. She tries every trick in the book; from rolling over to jumping from the bookshelf onto the table. She has also worked out that if she sits under a pizza box and taps the lid with her paw, pieces may just bounce along the cardboard and drop into her waiting mouth. So be warned anyone who encounters Peggy the Pugalier and double knot your sandwich bags, because the Monster will strike. Entries for February will close on Friday 22nd February. 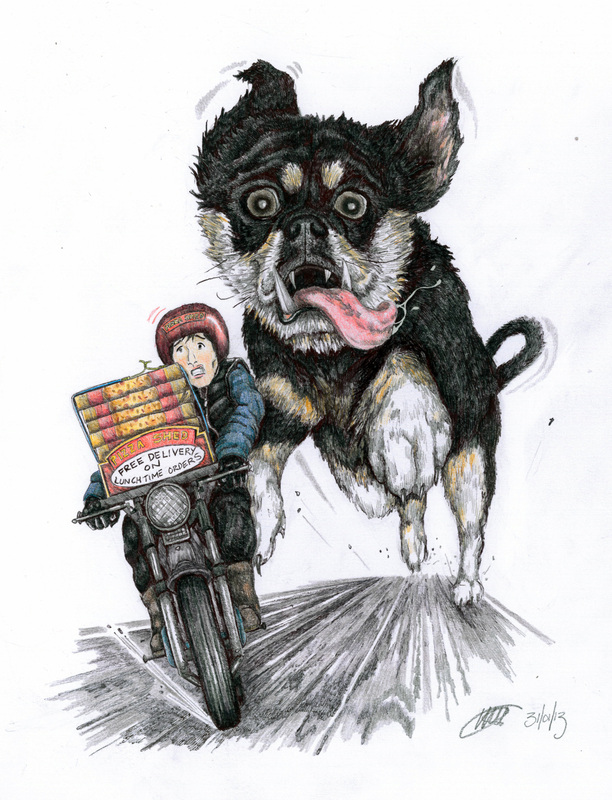 This entry was posted in Competitions, Illustrators and tagged anderson agency, art, aspiring illustrators, clare, illustrating, Illustrators, Jon Holder, literary agent. Bookmark the permalink. Jon Holder’s artwork is positively genius!